Tawa (or Tava) is an iron pan that is upside-down wok shape and it goes over fire or coal to cook roti, the flat bread. 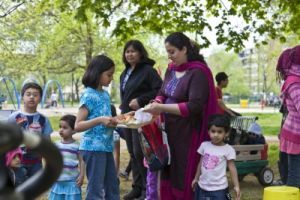 It's used widely in Asia where many of Thorncliffe residents come from. Mayssan and Jutta had found one in Little India on Gerrard Street, and we thought of having a little fire with members of Thorncliffe Park Women’s Committee (TPWC) to learn how to use it. 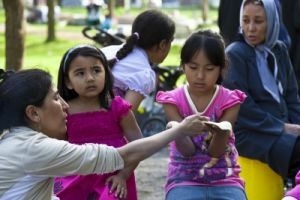 Then Jutta thought we should do it at RV Burgess Park instead of Dufferin Grove, as a preview of the community bazaar. But then things became less simple than a friends' gathering. TPWC had already been permitted to have six fires for the season, but they were told to give six weeks notice for any additional request. This wouldn’t work, so they asked again and the Recreation supervisor arranged for the gathering to be a Recreation program, meaning it didn’t need such a long lead-up. But he said no food could be served without Public Health approval. So we went back to the starting point, saying that it was a picnic with a cooking fire where friends would get together to make food (thus not under the Public Health regulation), but since we would be in public space, anyone was welcome to watch. This would have been enough, but the Recreation supervisor got an approval from Public Health anyways, and it became a public event. The back and forth took two weeks while Sabina of the TPWC, Mayssan and Jutta talked to the city officials. Phew, that was hopefully good practice for the city staff as well. So I packed several kilos of flour along with yeast and oil, also enough lentils to make a pot full of dhal to go with the bread. 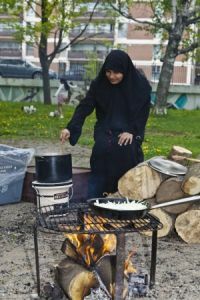 We met Zakia, our leading cook of the day, at the community centre. 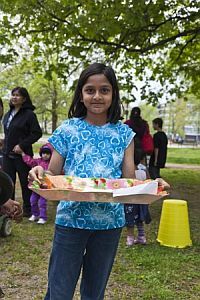 In the new but tiny Recreation Centre kitchen she made a simple dough just with flour, salt, yeast and water (some people include oil, Zakia said) while I chopped onions for dhal. When we came out to the fire site, everything was ready. But we had to wait for the Recreation staff to bring a fire extinguisher and strike the match. In the meantime, I started the charcoal cooker I had brought. I use this cooker called shichirin every day back home. It is an intelligently designed low-tech device that becomes quite powerful because of a good airflow underneath the coal. Today's fuel is the embers I had been saving from the ovens on our baking day at Dufferin. How satisfying to use by-product! 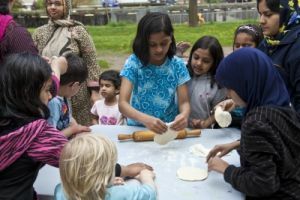 It started to rain lightly, but Zakia went ahead and had kids roll out the dough. A handful of flour was sprinkled on the tawa to test if it was hot enough, and the first one went on. When the edge curled up, Zakia pressed it with a towel to cook it well, flipped it, and a minute later it was done. Sabina, who is from India, thought the first one was a bit too thick, and decided to use it as a display as she didn't want people to think of it as real roti. Soon, everyone wanted to make it. The hot tawa cooked roti one after another, sometimes two at once. We tore them into pieces, put dhal and sauteed onion on top and had people sample them. It was so delicious. Sabina was right, I liked the thin part as it was crispy, different crispiness than fried stuff as it took no oil. But the display roti was also torn to feed the growing crowd. 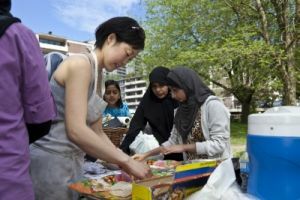 Rain had stopped, and Zakia continued to cook roti in the streaming sunlight. 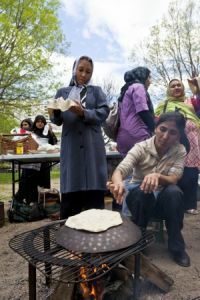 People rolled out the dough, watched them cook on the tawa, ate them while talking to each other. 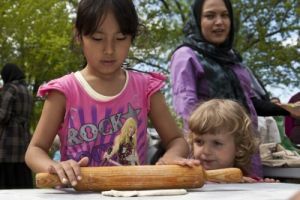 One boy was very proud that he had made roti, and intended to bring it home to show his mom until it went into his stomach five minutes later. A girl, another TPWC member's daughter, was helping serve samples for the whole time even though she herself was gluten intolerant. I had also brought some biscuit dough to cook in the Dutch oven, but there was not enough coal or space to cook them for everyone. A few people had it. Towards the end, Mayssan took over the tawa position as Zakia went off to make stuffed roti with spicy mashed potato filling she had made, which was fried in a pan with oil. When all the roti was cooked and the crowd had dispersed, we ate the special stuffed bread to treat ourselves after a big job. This was my first experience in this park. I had heard the park was used so much since it was almost the only outdoor green space in the densely populated neighbourhood. It is also one of the neglected parks, as shown in the case of playground that had been taken down without a replacement. TPWC has been working to draw politicians' eyes to the practical need of the residents, and has achieved much improvement. Today, it looked just lively with many families, people in beautiful saris or other traditional clothing. 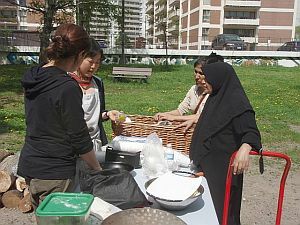 Next week the community bazaar starts, and a tandoor will come soon. The park is just going to get better.